The Messiah - Part 3 includes the final 8 songs from the classic oratorio by Handel. Fully recreated from Handel's original scores. Lead sheets are included for the Arias and Recitative numbers only. The Messiah - Part 2 includes the songs 22 through 44 from the classic oratorio by Handel. Fully recreated from Handel's original scores. Lead sheets are included for the Arias and Recitative numbers only. The Messiah - Part 1 includes the first 21 songs from the classic oratorio by Handel. Fully recreated from Handel's original scores. Lead sheets are included for the Arias and Recitative numbers only. 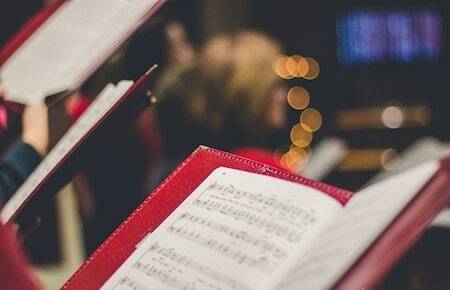 The massive final movement of Handel's Messiah, scored for SATB chorus and full orchestra, includes unison rhythm choruses, four part fugal sections, a big ending, and a four-minute Amen section that could be considered a separate movement. Trumpets and kettledrums boost the energy of this truly grand finale. A majestic, triumphant aria for bass, featuring solo trumpet and full orchestral accompaniment. Movement 48 of Handel's Messiah, it speaks of the end of the world: how the dead will be raised, and the mortal will become immortal. Quite lengthy, as practically the entire four-minute aria is repeated after a short interlude. Movement 47 of Handel's Messiah is a bass recitative that serves as a noble and grand introduction to the bass aria "The Trumpet Shall Sound". A dramatic SATB chorus, movement 46 of Handel's Messiah. Extremely slow and quiet sections describing death alternate with loud, upbeat sections describing resurrection. For this recording, organ quietly doubles the vocal parts in the a capella sections. A forceful, exciting aria for tenor, with lyrics describing God's wrath towards those who work against him. Orchestral direction follows the London Philharmonic recording. Movement 43 of Handel's Messiah, this aria occurs immediately before the famed Hallelujah Chorus. A brief tenor recitative, accompanied by harpsichord and strings. Movement 42 of Handel's Messiah, this functions as a short introduction to the tenor aria "Thou Shalt Break Them". M ovement 41 of Handel's Messiah is a lively, energetic SATB chorus. Imitative parts and frequent modulations present an interesting challenge for any choir. One measure has been added to the beginning to establish tempo and key. An exciting aria for bass soloist, movement 40 of the Messiah. Furiously bowing strings mirror the nations and kings in the lyrics, which "furiously rage together". A strong, energetic SATB chorus, movement 39 of the Messiah is fairly brief. Forte all the way through, it makes a good concert opener. The orchestra follows Handel's original score.